Advocacy to Amanda Brodhagen means taking action. It’s not just about sharing her farm experiences on social media — although she does plenty of that — it’s about taking time to volunteer at the Beef Farmers of Ontario booth at the Royal Agricultural Winter Fair each year as well as serving on the executive of the Junior Farmers’ Association of Ontario and talking up programs that celebrate farms. So it shouldn’t have been a surprise when Brod­hagen couldn’t resist the opportunity to raise the profile of agriculture by entering the recent Go Get Featured competition hosted by Fido Mobile and online lifestyle magazine, FLARE. The competition to find nine millennial women “Go-Getters” to feature on FLARE.com asked entrants to share the story of their “passion project” for a chance to win $1,000 towards their project and a trip to Toronto for an all-expenses paid networking dinner, photo shoot and video shoot for the online version of the magazine. Brodhagen grew up on the family cow/calf operation near Stratford, Ont. and never forgot the transformative experience she had as a mentee with the Cattlemen’s Young Leaders (CYL) Program. She had wanted to learn more about how to advocate and lobby for agriculture, so CYL paired her with mentor Dr. Lorne Hepworth, an Agricultural Hall of Fame inductee whose track record included several portfolios as a Saskatchewan provincial government minister, and 20-year head of CropLife Canada. When the contract position ended, OFVGA created a part-time position for Brodhagen as digital marketing manager for its publication, the Grower News. 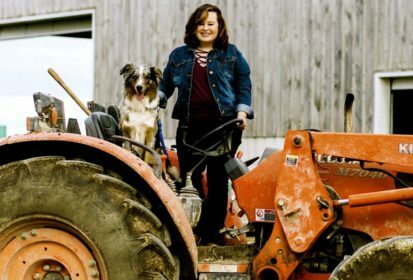 “I grew up on a beef cattle farm and here I am working in edible horticulture four days a week, but I really love advocating for farmers on the other half of the dinner plate too,” she says. It was that drive to advocate for agriculture that made Brodhagen sit down this past April and pour her heart out in the FLARE submission. Still, she was surprised to get an email the following week saying she was one of the top applicants. It turns out she was the only farm girl out of the hundreds of applicants from across Canada. “They were intrigued about the story of a young woman who’s just five foot tall and doesn’t fit the stereotype of a primary producer,” says the 29-year-old at the family beef farm near Stratford, Ont., that she runs with her dad, Martin. Brodhagen is proud of her independence and knows she is lucky to have such tremendous support from her parents. She knows other young women are pressured to find themselves “a man” in order to take on the responsibility of the farm. That independent streak, as Brodhagen is ready to admit, does make her a bit overly zealous at times, which is why, although excited by the news that she was a finalist in the FLARE competition, she now faced a dilemma. Her submission said she would like to create the mentorship program in collaboration with the Ag Women’s Network (AWN), a Facebook-based network of almost 2,000 women involved in agriculture that Brodhagen had joined. The problem was she hadn’t actually talked to them about it. She needn’t have worried. When she called AWN founder, Jen Christie, to tell her about her submission, Christie thought it was an incredible idea and was fully supportive. When FLARE called to tell Brodhagen she was a winner, she was working at the small feed mill on the family farm, and she sensed the irony that as she dealt with the high-gloss world of Toronto media, she was worrying about whether she had enough data left on her phone to take the video call. After letting AWN know her project had won and that she now had $1,000 to kick it off, Brodhagen connected with one of its leadership team, Joan Craig, a beef farmer and retired schoolteacher who is passionate about mentoring and offered to help her plan and develop the mentorship program. Although they had lots of big ideas they decided that realistically the project would need to be a pilot program in Ontario for AWN members. They hope it will give them experience and feedback that will allow them to attract more funding and resources in the future and lead to an ongoing mentorship program for ag women. They began by surveying AWN members’ level of interest in a mentorship program, asking what the women considered the most important aspects of mentorships in agriculture and looking for suggestions. Expecting maybe 20 or 30 responses, they were happily surprised to get 100. After analyzing the survey data, Brod­hagen and Craig came up with a draft framework that they then discussed with a small focus group of primary producers and other women from the agricultural industry. From there they came up with the final pilot mentorship program to run for eight months from November 2017 to July 2018. Applications closed in September, and mentees were matched with mentors in October. A big emphasis of the program is accessibility and diversity. Many respondents asked how much time they would need to commit, so the program design is flexible. Mentors commit to activities within a predetermined period of time to help mentees work through their roadmaps. Mentees must have the determination to make the most of their experience in order to complete the program, and be open to sharing their mentorship experience through AWN communications, including a blog post at the end of their mentorships. This article was originally published on Country Guide.